A 2011 Nobel Peace Laureate, Ms. Gbowee is a peace activist, trained social worker, and women’s rights advocate. Her leadership of the Women of Liberia Mass Action for Peace brought together Christian and Muslim women in a nonviolent movement that played a pivotal role in ending Liberia’s civil war in 2003. 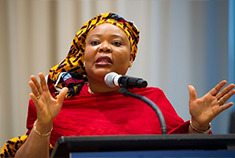 Ms. Gbowee is the founder and current President of the Gbowee Peace Foundation Africa, founder of the Liberia Reconciliation Initiative and co-founder and former Executive Director of Women in Peacebuilding Network/West Africa Network for Peacebuilding (WIPNET/WANEP).